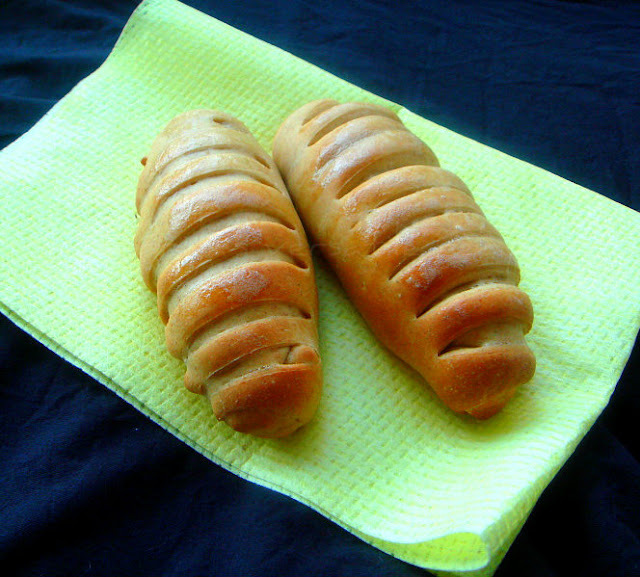 When i posted Brioche Rolls with Strawberry Jam two days back,many of my readers asked me to post the stepwise pictures to show how i prepared the rolls, finally yesterday i prepared some savoury rolls with potato-peas masala and cheese with the same method. This time without any fail,i clicked the stepwise pictures just to share with my readers, please forgive me for the poor light else those pictures will be definitely helpful to everyone whoever want to give a try to this cute rolls. Heat enough oil,let crack the cumin seeds and curry leaves, add the chopped onions,chopped green chillies,saute until the onions turns transculent. Add the green peas,garam masala powder,salt and cook in medium flame, springle some water and cook until the peas gets partially cooked. Finally add the cubed potatoes,cook for few more minutes until the masala gets well cooked. Keep aside and let them cool. Mix the yeast,sugar and salt in a cup of luke warm water and keep side for 5minutes until the yeast mixture turns foamy. Take the whole wheat flour in a bowl,slowly add the foamy yeast,water if needed and olive oil and knead as a soft dough. Place the dough in a greased bowl, cover the bowl with a towel and arrange in a warm place. Let them sit for two hours until they double their volume. After two hours, punch down the doubled dough and knead again, roll as 6-8medium sized balls. 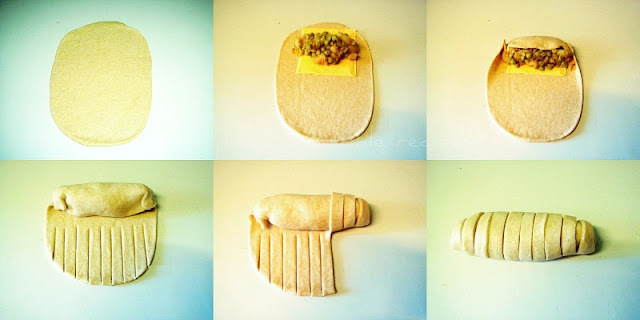 Dust a ball with enough flour, roll it as a medium sized rectangle disc, place the cheese slice and top it with the potato peas masala,cut the bottom part of the dough as small strips. Roll the masala placed part gently and place the strips one by one over the rolled part of the disc. Repeat the same process with the dough and keep the rolls over a baking sheet and let them sit in a warm place for an hour. Bake them for 20-25minutes until the crust turns brown. Finally brush the rolls with melted butter once its comes out of the oven. Garlic and coriander combo works out wonder in yeasted breads, i prepared this yeasted muffins for Bread baking day,but somehow i couldnt able to post it on that event day. Better not late, am posting today as i dont have any recipe for today's post.Yes am getting lazy coz of the sudden chilled weather and i didnt prepared anything for today's post as i do quite often. Coming to this yeasted muffins, they are super flavourful with garlic and coriander, obviously very quick to prepared once your dough gets doubled in size. Stir in the active dry yeast,salt,sugar in luke warm water, keep aside until the yeast turns foamy. Meanwhile take the all purpose flour,wheatflour,crushed garlic cloves,coriander leaves,chilly flakes in a bowl, add gradually the foamy yeast, water,olive oil and turn as a soft dough. Arrange this dough in a greased bowl and keep in warm place for two hours until the dough double their volume.. Grease the muffins moulds and keep aside. Punch down the doubled dough, knead for a while with enough flour. Roll the dough as a rectangular disc, cut a 5thick slices. Place the slices one over another strip and stack them. 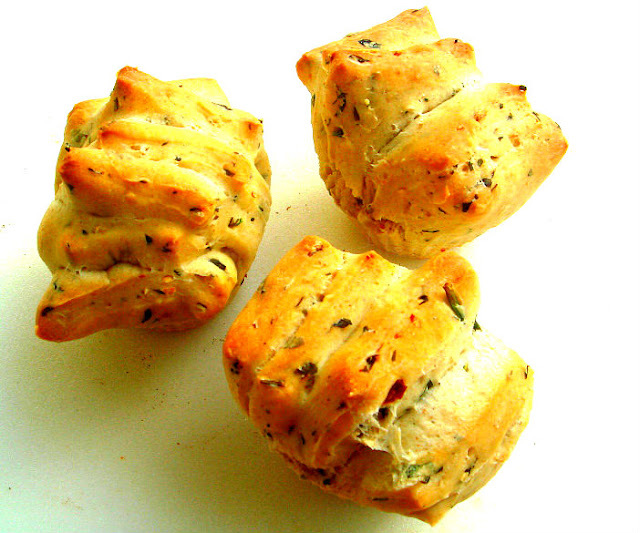 Cut those stacked dough as medium sized squares and place it in the already greased muffins tins. Place them in a warm place for an hour until they double their volume. Preheat the oven to 350F. Bake for 20-25 minutes until they crust turns brown. Keep aside and let them cool completely.. Sometimes i dont prefer to prepare my cakes with butter, so alternatively i go for half quantity of butter along with oil,but for our this month's Eggless Baking Challenge Gayathri,the brain child of this monthly event shared this butter cake with eggs. As its an eggless baking challenge,obviously we have to prepare this cake without eggs. 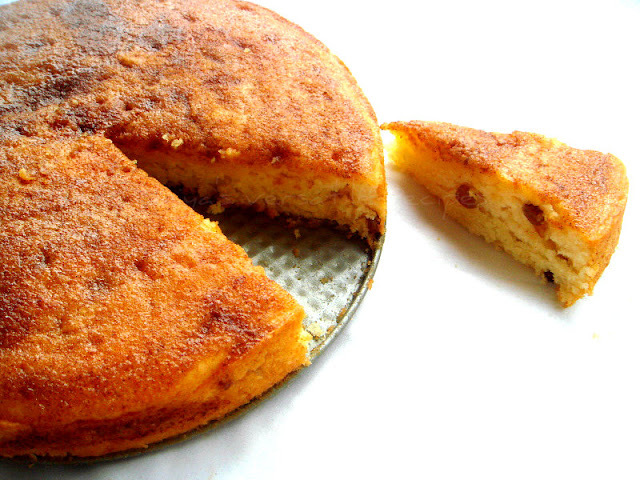 Eventhough this cake goes for butter, as main ingredient this cake was simply awesome, the final touch was the topping mixture prepared with cinnamon powder, brown sugar and butter spreaded over the baked the cake turned out this cake absolutely flavourful. Grease a spring form tin with enough butter and keep aside. Beat together the butter and sugar until they turns creamy, add the yogurt to this mixture and beat for few minutes. Meanwhile sift the flour with baking powder and keep aside. Now fold in the flour to the butter-yogurt mixture gently with a spatula, stir in the sultanas and milk. Pour this cake batter to the prepared tin and bake for 20-25minutes. Mix all the ingredients given under the list for toppings in a bowl and keep aside. Once the cake gets baked,remove the cake from the oven. Spread immediately the butter mixture prepared for toppings immediately over the cake. Let it sit for few minutes. Serve warm with a cup of tea or coffee. Brioche, an incredible spongy bread highly light and super puffy with a rich and tender crumb. 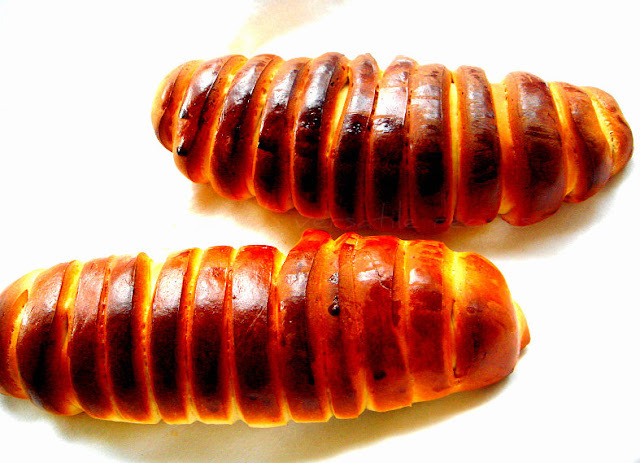 These bread are loaded with eggs and butter. Since ever i tried brioche with less butter, am making my brioche quite often at home with different filling. Recently i prepared this damn cute looking brioche rolls and we had this jam filled brioche rolls for our sunday's brunch. Mix the yeast,a teaspoon of sugar and salt to the luke warm milk, keep aside until the yeast turns foamy. Meanwhile take the flour,egg yolks,sugar in a large bowl, add gradually the foamy yeast and turn everything as a soft dough, now add the butter and knead everything for 10minutes. Arrange the dough in a bowl covered with a towel,keep aside for atleast for 2hours until they double their volume. Knead the dough again for few minutes and divide the dough as 8-10medium sized balls. Dust a ball with enough flour, roll it as a medium sized rectangle disc, place a teaspoon of the jam and cut the bottom part of the dough as small strips. Roll the jam placed part gently and place the strips one by one over the rolled part of the disc. Mix the egg yolk with milk for brushing together, now brush the uncooked brioche rolls generously and bake them for 20-25minutes until the crust turns brown. Cool it completely on a wire rack. Baby potatoes are one of my weakness, i just love them. I never forget to pick atleast a kg everytime i go to farmer's market. These baby potatoes goes awesome with anything and i never stopped myself to add them in my gravies or curries. My recent favourite is this baked,guilt free and delicious starters with baby potatoes. If you have potato lovers around you these tiny baked beauties will definitely satisy their taste buds, i used store bought tandoori masala powder for making this tiny beauties. 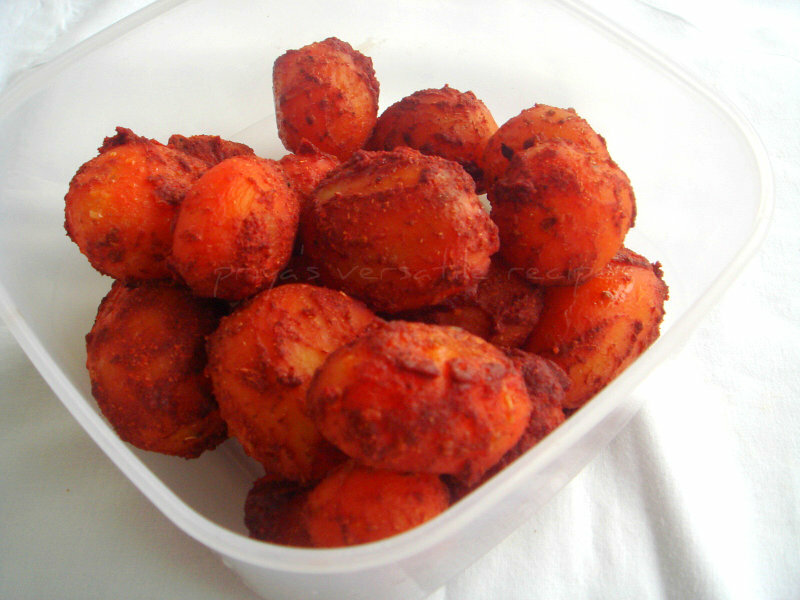 Obviously this is one of the easiest and definitely a tastiest baked guilt free starters to enjoy without any hesitation.If you dont like baking, you can deep fry or shallow fry them and enjoy.This guilt free tandoori baby potatoes are going to Kid's Delight-Healthy Makeover guest hosted by Rasi, event by Srivalli and to my own event Healthy Diet- Healthy Finger Food guest hosted by Preeti of Isingcakes. Cook the potatoes in boiling water until they get partially cooked. Peel and prick them with fork gently. Meanwhile beat the yogurt till smooth, add the lemon juice,ginger garlic paste,tandoori masala powder,garam masala powder, chaat masala,paprika powder and salt,with oil and mix well. Put in the potatoes and gently mix until they get well coated with the marination. Keep atleast two hours in fridge or marinate overnite will works very well too. Preheat the oven to 350F, grease a baking sheet with enough oil. Arrange the marinated potatoes one by one and bake for 20-25minutes until the crust turns crispy. Love nuts in bakes and i know i will be making a pumpkin pound cake for the weekend bake.Finally combined both the pumpkin puree and coarse pistachio nuts to make this spongy and super moist pound cakes. Pistachio nuts gives a wonderful and marvellous texture to this cake and you can enjoy thoroughly just along with a cup of tea or coffee for your evening snack or either for a quick breakfast. Preheat the oven to 350F, grease the mini loaf pan and keep aside. Lightly whisk the eggs,yogurt and vanilla in a medium bowl, meanwhile take the flours, sugar,salt in a large bowl,mix for few seconds. Now whisk the softened butter,pumpkin puree and half of the egg mixture,add to the dry ingredients get moistened, beat in medium speed for a minutes,scrap down the sides..
Add the remaining egg mixture as two batches and beat again for few minutes,scrap down the sides. Add the coarsely chopped pistachio nuts,give a quick stir and pour the batter into prepared pan, smooth the surface with a spatula. Bake for 35-40minutes until a toothpick inserted in the center comes out clean..
Let the cake gets cool completely and enjoy. Foxtail millet is one of the forgotten grains cooked earlier in some part of Tamilnadu and this is called as 'Thinai' in tamil, its offered to Lord Muruga as prasadam. Millet flour mixed with honey is often offered to this god. There is a wonderful story behind this offerings and its a custom to give this millet flour mixed with honey as prasadhams to the devotees. Earlier this grain's flour is eaten for breakfast by the farmers before leaving to their work, but this grain is completely forgotten in our cuisine nowadays.Since i heard lot about this grain i coudnt stop myself getting them from the nearby organic store and started cooking once a week now.This grain is known as Korralu in Telugu, Kangni in Hindi and Navane in Kannada. Even now in some part of Andhra, people cooks this grain as like rice and have them with curries.This grain is completely versatile as like quinoa so that you can mix and cook as anything with anything. For the second day of blogging marathon, as my theme is cooking with moongdal i quickly prepared this crispy chops with cooked millet,cooked yellow split moongdal and sweet corns as chops for evening snacks. You can also use this chops as koftas for making a delicious gravy. Serve this chops with ketchup,everyone at home will definitely enjoy this wonderful crispy beauties.I shallow fried my chops, if you want them more crispy you can deep fry them.Check out the other marathoners running this 21st edition of blogging marathon here.Am sending this chops to my own event Healthy Diet- Healthy Finger Food guest hosted by Preeti of Isingcakes. Take the cooked millet,cooked moongdal,sweetcorn,mashed potatoes, garam masala powder,amchur powder with enough salt in a bowl and mix everything well. Meanwhile heat few drops of oil,saute the onions,green chillies together until the onions turns transculent. Now add the ginger garlic paste and cook for few minutes until the raw smell goes away. Add the sauteed onions to the millet-moongdal mixture and mix everything well. Roll them as oval and keep side. 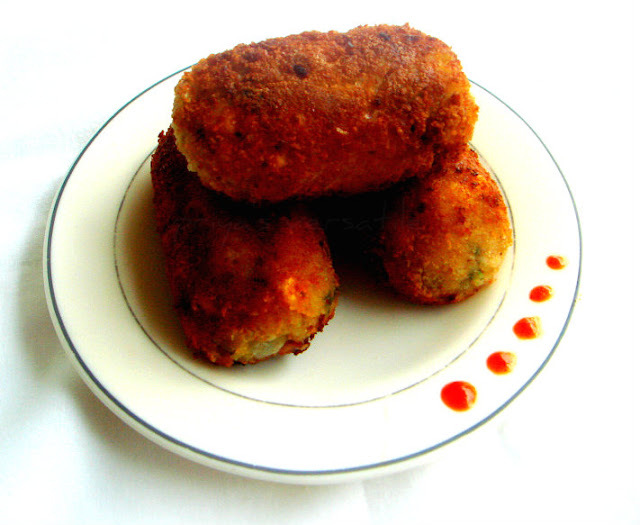 Make a paste with corn flour and water,dip the rolled chops to the cornflour paste and roll well over the bread crumbs. Keep this chops in fridge for an hour..
Heat enough oil for shallow frying, fry the chops in small batches until they turns golden brown. 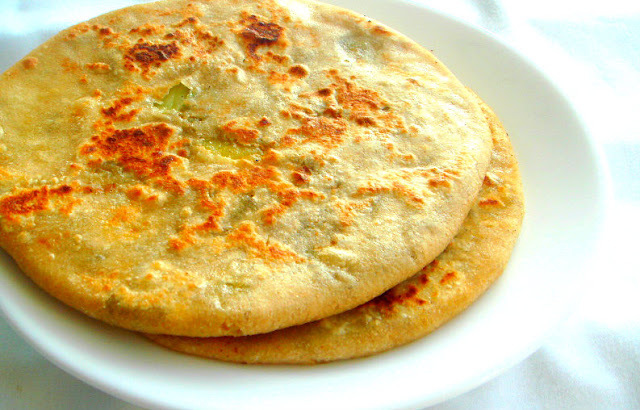 Enjoy with ketchup or any hot sauce..
As i told earlier most of our dinner goes for almost oil-less rotis, but sometime i manage to make some stuffed parathas with our favourite aloo stuffing. Here we start again three days of blogging marathon, so this week's theme is gonna be cooking with moongdal. Obviously next two day's recipes are going to be foods prepared either with whole green gram or with split yellow moongdal. For the first day of blogging marathon, i went for this delicious and super filling potato and whole green gram stuffed paratha. I prepared the stuffing with cooked potatoes and cooked green grams which i spiced simply with onions,greenchillies,garam masala powder and chaat masala. This paratha doesnt even need any side dish to enjoy,the stuffing itself will replace the side dishes usually we make for rotis. Check out the other marathoners running this 21st edition of blogging marathon here. Take the cooked potatoes,cooked greengram,chopped green chillies,garam masala powder,chaat masala and salt, mix everything well and keep aside. Saute the chopped onions with enough oil and add it to the already prepared potato-greengram mixture,mix well. Make medium sized balls from the dough, flatten them as small circles with the rolling pin, drop enough aloo-greengram masala and cover the masala by sealing the edges of the flatten dough. 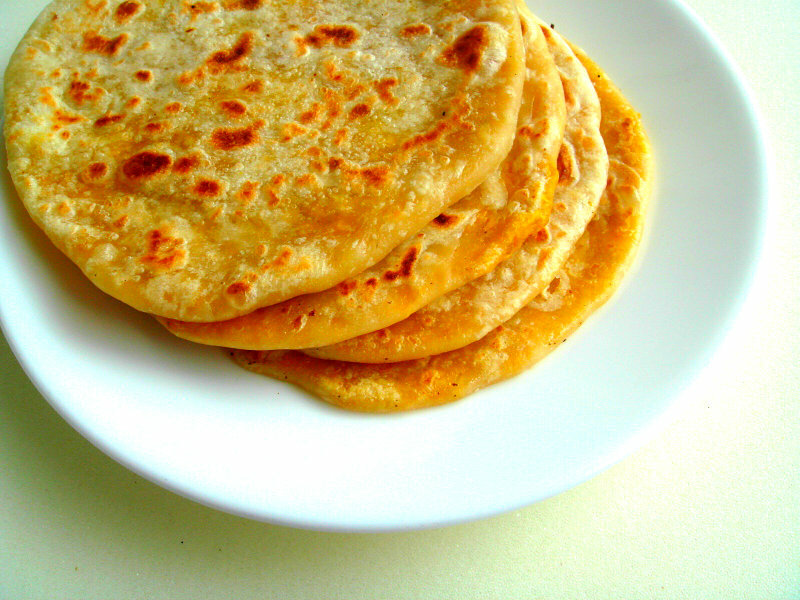 Dust with flour and roll them gently as parathas. Heat a tawa, drop this flattened paratha over the hot tawa, drizzle few drops of oil and cook until they get well cooked.. Happy Saraswathi Pooja to everyone friends. 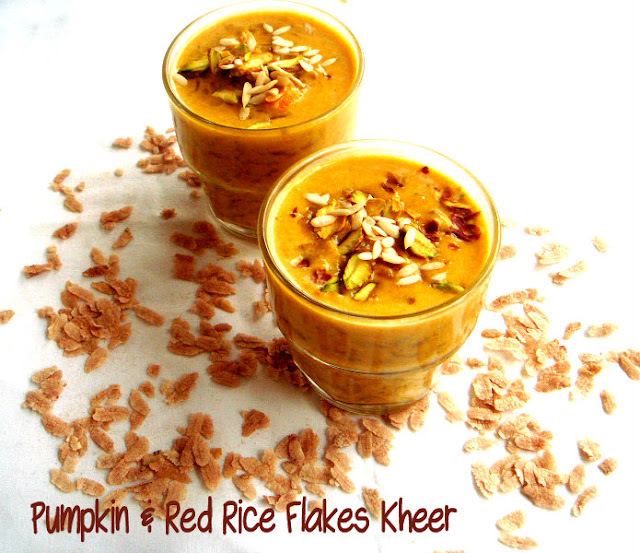 Well, i think this is my seventh guest post for my blogger buddies, i prepared this super delicious kheer with pumpkin and red rice flakes for Aparna of Aps Kitchen. Few days she pinged me in FB and asked whether i could make a guest post for her, i accepted it immediately.We are friends since a long through this virtual world and i love her Konkani cuisine very much. I know i'll be making something sweet for a sweet friend, since i prepared pumpkin puree for a bake and as there were some leftover i turned those leftover pumpkin puree as this wonderful kheer with red rice flakes. Recently i bought this red rice flakes for making upmas and personally i got hooked with this healthy flakes than the usual white ones, i couldnt stop myself adding them in most of my dishes nowadays. Coming to this kheer, you will definitely love the addition of pumpkin puree in this kheer, both rice flakes and pumpkin puree works out wonder together. Check out my guest post for Aparna here. Bring boil both milk and sugar together cook until the milk get half reduced in low flame. Meanwhile heat the ghee in a kadai and roast the red rice flakes and keep aside. Now add the pumpkin puree, condensed milk to th boiled milk and bring again to boil, put the flame in simmer and cook them for few minutes. Add the roasted red rice flakes, keep the flame in medium high, cook until they gets cooked. Finally add the cardamom powder to the kheer, stir them well before and switch off the stove. Serve warm topped with chopped pistachio nuts. I really want to bake some yeasted bread with nutella and cinnamon combination since a long, finally baked as yeasted muffins during this week end. Nutella and cinnamon combo works out wonder and this muffins turned out fabulously awesome. We started our sunday with these cuties with a cup of hot chocolate for our brunch. Since i used wholewheat flour making this yeasted muffins i can say that these muffins are healthy. These muffins are seriously very addictive, i prepared almost a dozen of muffins and none is leftover here. Needless to say its my lil one's favourite now and am gonna make some soon again for our next week's sunday brunch.Am sending this muffins to my own event Healthy Diet- Healthy Finger Food guest hosted by Preeti of Isingcakes. In a small bowl, add the active yeast, sugar and salt in luke warm water , give a stir and keep aside, let it sit for 5 minutes until it turns foamy. Take the wheat flour and melted butter in an another large bowl,gradually add the foamy yeast to the flour and knead as dough. Dust the dough with enough flour and knead for few minutes until its turns soft..arrange the dough in a greased bowl , let it sit for an hour in a warm place. Punch down the dough, springle few flour and knead again for few minutes, flatten the dough with a rolling pin. 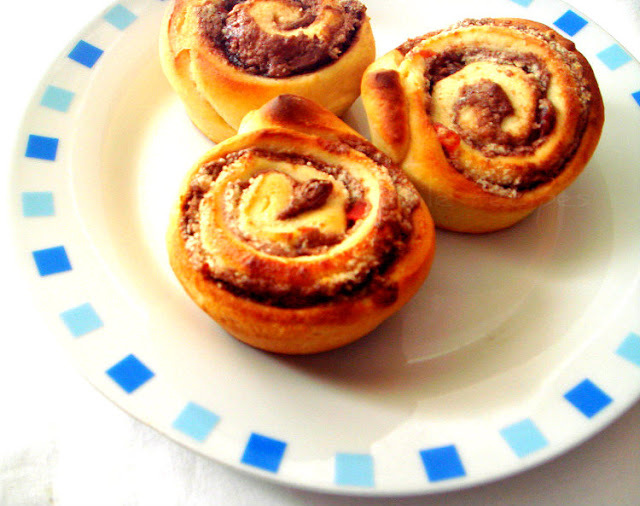 Spread the nutella spread and springle the cinnamon powder,almond powder over the dough..roll the dough tightly as a loaf. Slice the rolled loaf as medium sized pieces and arrange them in a greased muffin tray and keep it in a warm place until they double their volume. Preheat the oven to 350F,arrange the muffin pan in the middle rack and bake the uncooked muffins for 20-25minutes until its turn golden brown. Brush them immediately with butter and let them cool.. Enjoy with your favourite coffee,tea or hot chocolate. Once a week, even a easy breezy,quick scrambled eggs can make me definitely comfort. Sunday lunch is something special always at our place that too when my betterhalf dont work on weekends. Obviously most of our sunday lunch will definitely goes for pulaos,briyanis or special one pot meals.Egg dum briyani was one of my DH's favourite, also its doesnt need any special side dish or any other gravy to accompany this super flavourful briyani as the eggs itself will definitely replace those side dishes or gravies, eventhough i served this briyani with my lil one's favourite carrot raita. Give a try once friends, you will definitely fallen in love with this flavourful rice. Eventhough the ingredient list goes for a long list, the cooking process goes for an easy breezy preparation. If you forget to get your meats or fish for your sunday special lunch, dont worry you can make this yummy briyani with eggs. Wash and soak the rice for 10minutes in enough water,keep aside. Cook the eggs and peel the skin;poke it with a fork, heat few drops of oil and fry in medium flame until the eggs gets well fried and brown, keep aside. Heat enough water with the spices given under the list 'for cooking rice', ghee and salt,add the rice and continue to cook until the rice get half cooked,drain the water. Discard the spices from the rice and keep aside. Meanwhile heat the oil and ghee in a wide open pan, fry the bay leaves until brown and fry onions until they turns pink, add now the chopped tomatoes,ginger garlic paste, mint leaves,slit opened green chillies and fry for few more minutes. Now add the garam masala, briyani masala,red chilly powder and fry everything again for few minutes. Add the fried eggs to the cooking spices, add now the yoghurt and saute until the oil separates. Take a big pot with a lid, add the half of the egg-spice mixture to it, spread half of the cooked rice on the top. Repeat the same process until everything get finished. Cover the pan with damp cloth and the lid. Cook in low flame for 15-20minutes or bake in oven for 20minutes at 350F. Serve this flavourful briyani with raita. 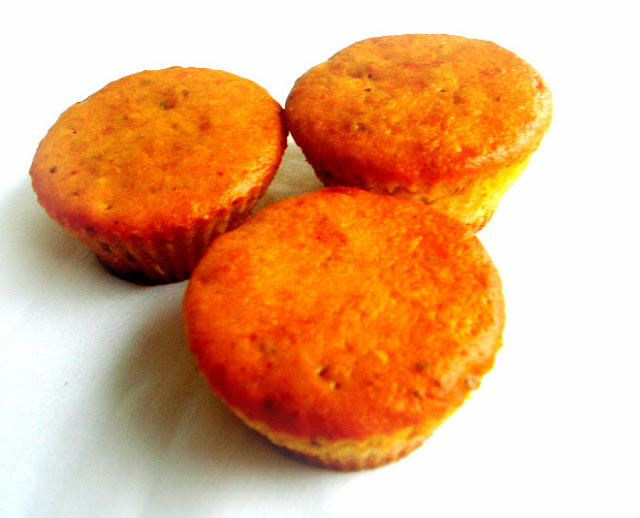 If you love having eggless muffins for our breakfast like me, this muffins are for you.I went for both pumpkin and dates puree for making this wonderful looking muffins. Obviously its a wonderful way to sneak the famous iron rich healthy dates and none at home will definitely find out the famous 'secret ingredient'. 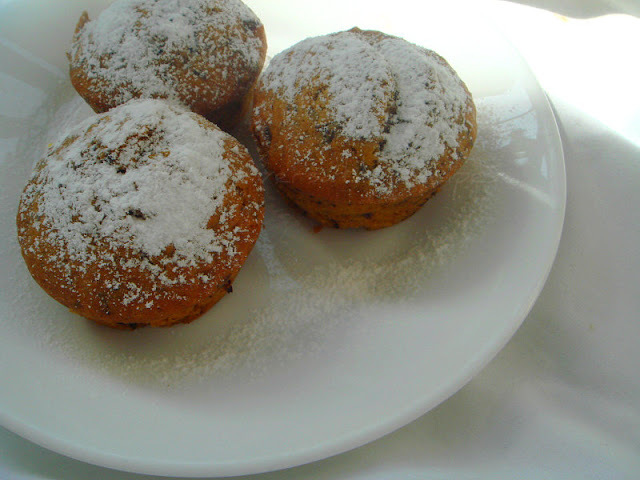 I used cinnamon and nutmeg powder in this muffins,these both spice powders completely masked the smell of pumpkin and dates. Just have two of this muffins for your breakfast with a cup of coffee to kick start your day,these muffins will definitely satisfy you. Am sending this muffins to my own event Healthy Diet- Healthy Finger Food guest hosted by my wonderful friend Preeti of Isingcakes. For making dates puree, just soak 10 or 15numbers of deseeded dates in hot water,grind as smooth paste with enough soaked water, this is how i prepared my dates puree.You can use very well store bought purees or canned ones for this muffins but somehow i like to make these kind of purees with fruits myself at home. If you want you can also go for chopped dates instead of dates puree. Preheat the oven to 350F, line the muffin cups with paper liners and keep aside. Sift the flours,baking soda,baking powder, spice powders and salt and keep aside. Fold in the flour mixture gently and mix with a spatula,dont overmix. Fill the muffin cups with this batter, bake in middle rack for 20 minutes until a skewer inserted comes out clean. Cool completely and enjoy with a cup of coffee. Making out cookies with custard powder is in my to do list since a long, finally i prepared some custard thumbprint cookies as eggless version last weekend. This cookies goes for simple ingredients and seriously very addictive, i baked almost two dozen of this cookies and i just had a chance to taste two cookies only. Yep they just vanished quickly,especially among the lil ones. 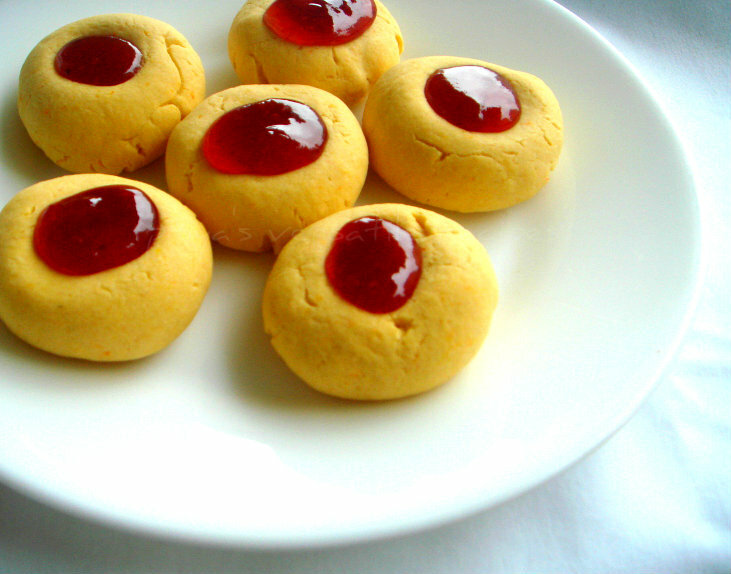 These cookies are super delicious and buttery, with strawberry jam i dont have words to say how yummy these cookies are.You can use any kind of preserves or else nutella spread to fill this easy breezy thumbprint cookies. My next try is gonna be surely a nutella filled thumbprint cookies, as these cookies are super duper hit among my kids.Sending to my own event Healthy Diet- Healthy Finger Food guest hosted by Preeti of Isingcakes. Prheat the oven to 350F, line baking sheet over a baking tray and keep aside. Sift together the all purpose flour and custard powder, add in the vanilla extract,keep aside. Whisk the butter,confectioner's sugar together until they turns creamy, add immediately the flour-custard powder mixture and gently mix until they forms as a soft dough. Shape the dough into small walnut sized balls and flatten them gently. Place them on the lined baking tray. Make an indentation in the middle of the each cookie and bake for 15-20minutes. Meanwhile heat enough strawberry jam in microwave oven for few seconds. Once the cookies gets cooled, fill the cookies with the melted jam. Sandwiches gets ready in a jiffy and they suits prefectly anytime of the day. I quickly prepared this yummy potato and spinach sandwich with an easy breezy potato and spinach filling.Love this kind of simple and healthy stuffed sandwiches for my lunch coz they are light,yet filling and definitely dont make you feel sleepy if you have loads of stuffs to do. 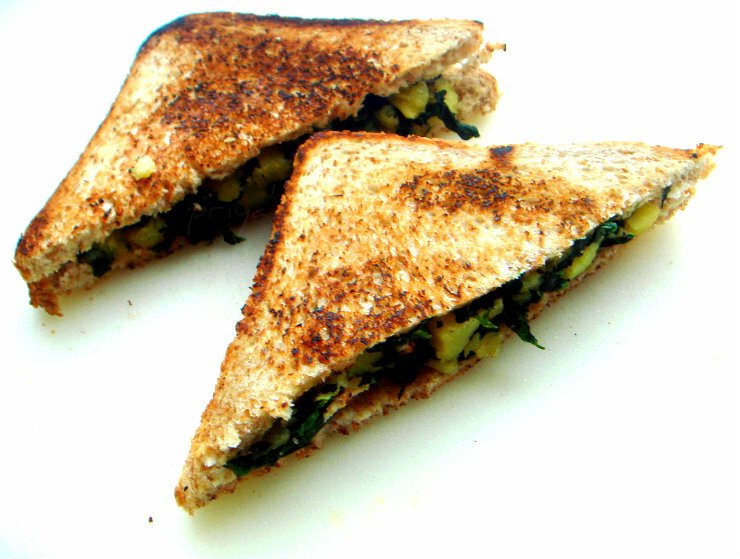 For this week's blogging marathon as i went for sandwich as this week's theme,my third post is this yummy and healthy potato and spinach sandwich. With a simple cucumber salad, this sandwich will definitely satisfy you.Seriously you can carry this sandwich easily to a picnic,just wrap them correctly and enjoy.Check out the other marathoners running this 21st edition of blogging marathon here.Sending to Vandana's Sandwiches and Burgers - Food Fun and to my own event Healthy Diet- Healthy Finger Food guest hosted by Preeti of Isingcakes. Heat enough oil, fry the cumin seeds and add immediately the chopped onions and saute until the onions turns transculent. Add immediately the chopped spinach, salt,cook for few minutes. Now add the cubed potatoes,garam masala powder and pepper powder, cook everything in simmer until everything get well cooked,put off the stove. Toast the bread slices, spread gently the already prepared potato-spinach mixture to a toasted bread slice and cover it with an another bread slice. Serve with a cucumber salad. Open faced sandwich is prepared usually with a singe bread slice, you can make this quick and easy sandwich with any kind of veggies,fruits or simply with a spread. 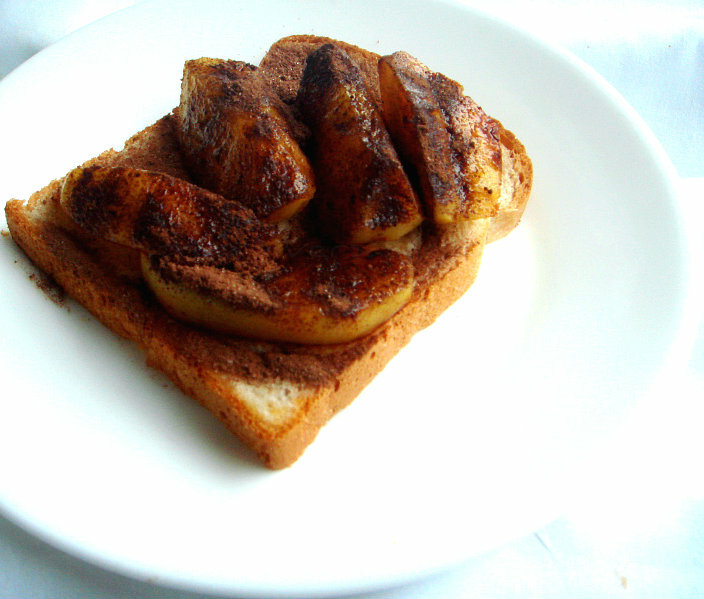 My open sandwich goes for apple chunks,honey and nesquik. Nesquik is a kind of chocolate powder flavouring mix quite popular here,obviously most of the french kids starts their day with this nesquik flavoured milk for their breakfast. This nesquik powder suits prefectly for making shakes,recently instead of nutella spread i just prepared a quick sandwich with just butter and this nesquik powder,it was a big hit among my kids. When i chose sandwich for this week's theme,i know i'll be making the same nesquik sandwich with some fruit chunks. I choosed apple chunks which i caramelized quickly with honey and served warm with nesquik, seriously my lil one simply enjoyed having this incredible open faced sandwich for his snacks, now i know how to feed fruits easily to my lil one. 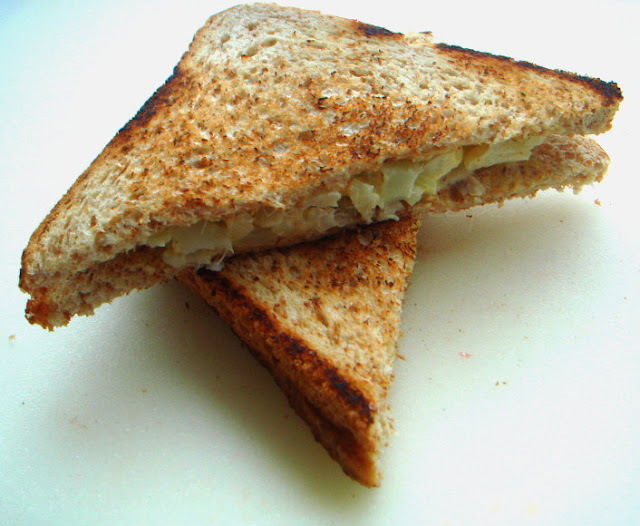 You can mix and match any fruits for making this simple sandwich. Heat the butter in a pan, add immediately the apple chunks,honey and cook in medium flame until those apple chunks gets well caramelized. Arrange the caramelized apple chunks over a bread slice as per need and sprinkle generously the nesquik powder immediately. 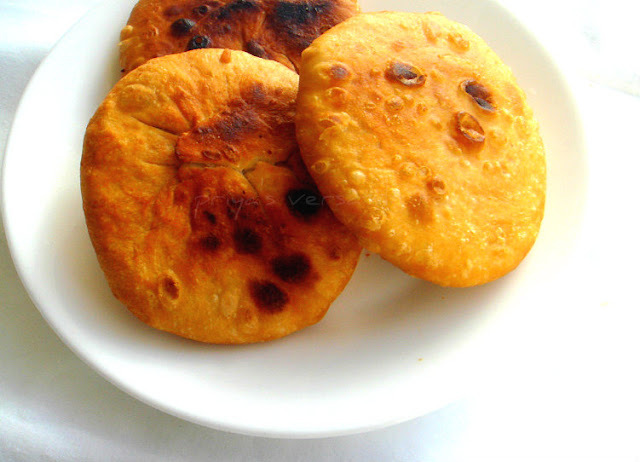 Kachoris, the word itself makes me drool, i have already tried few varieties of kachoris. For this month's Indian Cooking Challenge, Srivalli aked us to choose any of the recipe from our earlier challenges. Since most of our challenges were very much related to Indian festivals and many of us didnt had a chance to make some challenges till now, its quite a fabulous opportunity to give a try to the challenges we havent finished yet. So i choosed to make some muttar ki kachori she shared during our 2010th January challenge, actually i cooked Pyaz ki Kachori for that challenge eventhough i wanted to make some muttar ki kachori since a long. Obviously i used this opportunity to cook some yummy muttar ki kachori two days back for our snacks. They came out extremely yummy,flaky and super crispy, we simply enjoyed these crispy beauties for our snacks with a cup of coffee while its raining outside. Mix the flour and salt, gradually add the ghee and turn the the flour as bread crumbs like texture, slowly add the water and make a soft dough, knead well. Cover and keep aside for atleast half an hour..
Coarsely grind the green peas,green chillies and ginger and keep aside. Heat the oil in a pan,add the nigella seeds, fennel seeds, bay leaves and fry. Add the greenpeas mixture and saute in low flame few minutes. Now add the chilli powder, garam masala and salt and sauté for 2 to 3 minutes.Add the chopped coriander and mix well. Allow the mixture to cool completely and divide into 12 equal portions and keep aside. Make a small ball from the dough...flatten the ball using your fingers having the center thick and sides little thin. Place about 2 tsps of the greenpeas filling in the center of the rolled dough. Cover the filling with the dough by slowly stretching it over the filling. Seal the ends and remove excess dough. Repeat with all the balls and keep aside for 5 -7 mins. Then using your palm, flatten the balls by lightly pressing it,keep aside covered. Repeat with the remaining dough,meanwhile heat some oil for deep frying. The oil should not become smoking hot. Fry the kachoris in small batches gently into the oil. It should rise up slowly.Cook for about 6 to 10 minutes till the side down gets a golden brown color. Turn and cook the other side for another 6 minutes or till its golden brown in color. Remove when done, cool and store in airtight container. 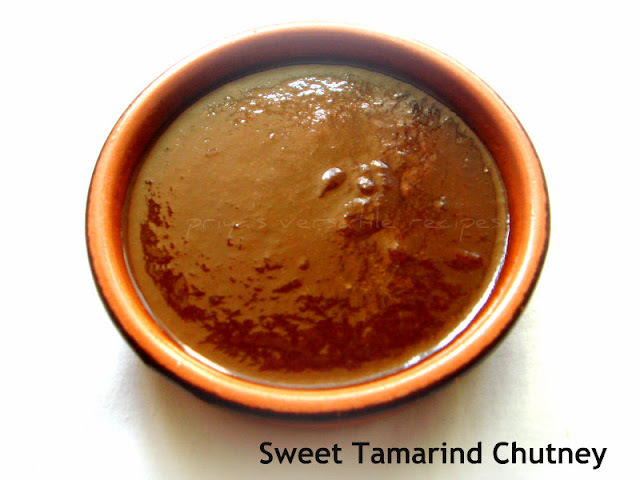 Enjoy with coriander or tamarind chutney. As i told earlier,being a member of Baking Partners we get three different recipes for our every month's challenge, obviously we can bake anything from those three recipes, i have already posted an incredible Chocolate Pumpkin Cupcake with orange cheese cream frosting suggested by Priya. Coming to this fabulous looking muffins, it was suggested by Reshmi of Easy Cook from Joy of Baking. Actually this muffins goes for all purpose flour,chocolate chips but i went for whole wheat flour and finely chopped dark chocolate bar. These muffins came out extremely soft and quite addictive, chocolate chunks in this muffins brings a wonderful texture while having this muffins and obviously all the spice powder used in this muffins completely masked the smell of the pumpkin puree. I prepared my pumpkin puree myself, by cooking them in boiling water and pureed once they get cooled without any water. 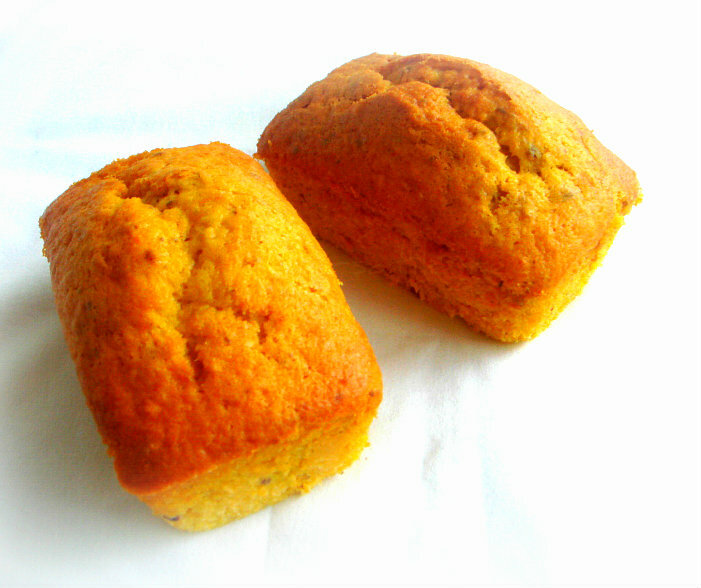 You can also use canned pumpkin puree for making this muffins, definitely you guys have to try this muffins atleast once. Sift the flour,baking soda,baking powder, spice powders and salt and keep aside. In an another bowl,beat the butter and sugar together until they turns fluffy, add the eggs one at a time and beat well. Beat in the vanilla extract,pumpkin puree. Fold in the flour mixture,chocolate chunks gently and mix with a spatula,dont overmix. Fill the muffin cups with this batter, bake in middle rack for 20minutes until a skewer inserted comes out clean. We Baking Partners will be baking different bakes every month and will be posting every 15th of the month. This month challenge is cupcakes or muffins, this is our third challenge after a wonderful almond cake and cookies. Swathi of Zesty South Indian Kitchen, the brain child of this fabulous baking event send us three interesting cupcake and muffin recipes.Three of our baking partners suggested us these beautiful recipes and i choosed to bake two among them,one is this super delicious,addictive chocolate pumpkin cupcake. When its comes a bake with chocolate, everyone at home will never hesitate a second to request me to make some.While going through the mail i recieved with this month's challenge, i know i'll be making this chocolate pumpkin cupcakes and gathered everything to make this incredible cupcakes during a weekend. My kids enjoyed thoroughly and even my lil one helped to squeeze out the frosting.Priya R of Cook Like Priya suggested this cupcake recipe from Country of Living. Preheat the oven to 350F, line the cupcake moulds with cupcake papers, but i used my silicon moulds. Sift the flour with cocoa powder,baking soda,cinnamon powder and nutmeg powder in a large bowl and keep aside. Combine the buttermilk,pumpkin puree, vanilla extract in an another bowl and keep aside. Beat the butter,sugar together in a bowl with a electroc mixer until the mixture turns fluffy, add the eggs one at a time and beat well after each addition. Alternately add the flour mixture and the buttermilk mixture,blending well after each addition. Spoon out this batter to the already prepared cupcake moulds and bake in middle rack for 20-25minutes until a skewer inserted comes out clean. Keep aside and let them cool completely. Blend the cream cheese,butter,orange juice,orange zest,vanilla in a large bowl using a electric mixture until smooth. Slowly add the sugar and continue to beat until the mixture turns light and creamy.Arrange in fridge atleast for an hour before frosting. Fill this chilled frosting in a pastry bag with your favourite nozzle or tip and squeeze gently to decorate. 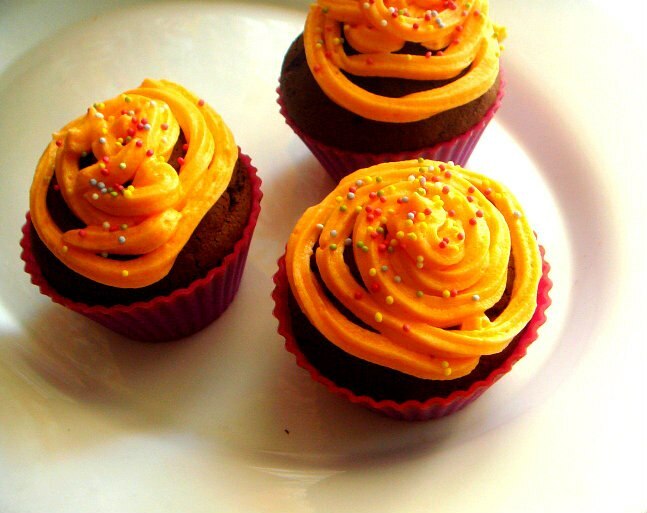 Enjoy this cupcake with a cup of tea, beware that this cupcakes are pretty addictive. 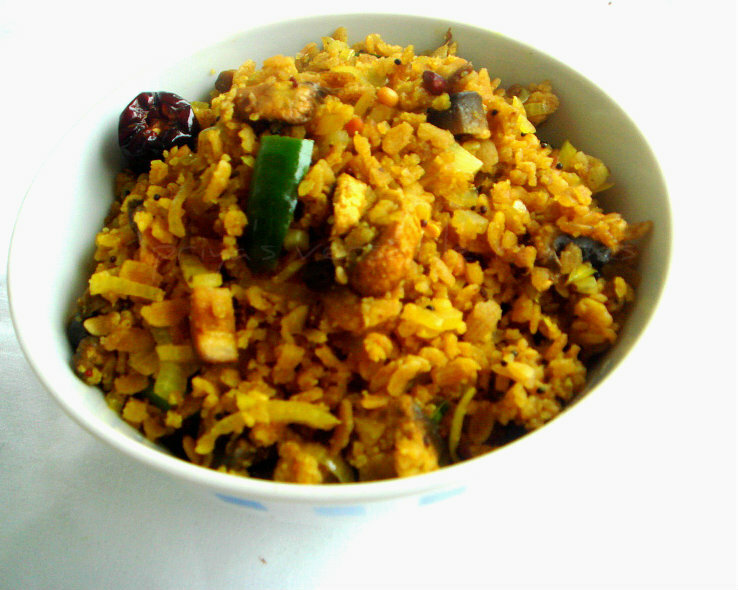 Making Dindugul famous thalapakattu briyani is quite like a dream for me, i tasted this flavourful briyani long back. Dindugal is a city in Tamilnadu state of Southern part of India,this city is famous for its fort, locks and steel safes, also very popular for thalapakattu or thalapakatti briyani. This briyani is quite special in taste as its goes for special rice called Seeraga samba rice and the slow cooking process.I was planning to make this mutton briyani since a long,finally i prepared them for our today's lunch.Thalapakattu briyani tastes surely different from other briyanis you have already tasted. 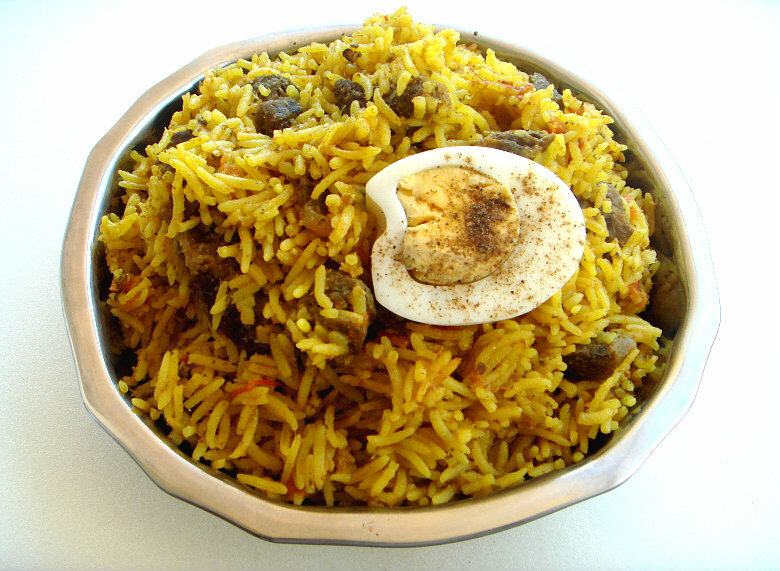 The secret of this briyani is to grind each ingredients and frying them until a nice aroma comes from. This briyani will definitely goes for a time consuming cooking process but i will definitely says that its worth to give a try this super flavourful,inviting briyani. You can prepared this briyani either with chicken or mutton, i went for mutton and used usual basmati rice as i dont get seeraga samba rice here.Sending to Asiya Omar's Feast of Sacrifice. Marniate the mutton pieces with all the ingredients under the list 'for marination' and keep aside atleast for 2-3 hours, even more better if you prepared it overnite and keep in fridge. Wash the basmati rice twice and soak with enough water for 15minutes. Now grind the onions with green chillies,coriander leaves, mint leaves as coarse paste. Grind the tomatoes as coarse paste and keep aside. Grind the coconut as fine paste and extract 2cups of coconut milk and keep aside. Pressure cook the marinated mutton pieces upto three whistles with a cup of water. Once the steam gets released, strain the stock from the cooked meat and keep the meat and the stock aside. In a large vessel, heat the oil and ghee.. Fry the bayleaves, cloves,cardamom,cinnamon sticks until they turns brown, add immediately the coarse onion paste and fry for few minutes. Add now the tomato paste, ginger garlic paste and fry everything until the raw smell goes away,finally add the cumin powder and fry againfor few minutes. Now add the cooked mutton pieces and cook for few more minutes. Meanwhile strain the excess water from the soaked rice, add this rice to the cooking meat mixture and cook covered for 5minutes in low flame. Add the 2cups of coconut milk and cook for 5minutes, once its starts bubbling, add the 3cups of meat cooked stock water, salt (if needed) and cook in medium low flame. Mine took 15minutes to get ready, once the rice cooked well, squeeze out the juice from half of the lemon and give a stir. Serve hot with raita and hard boiled eggs. If you are born and brought up with fresh sea foods, you will definitely miss them if you are not living in your home town,really i miss my home town especially for their super fresh seafoods. Nothing will beat those fresh seafoods, you have to compromise with the frozen ones if you live far away from your country as some of us will do. We have to mix and match these available frozen seafoods here according to our tastebuds , before a month i prepared this tasty puttu aka hash with frozen tiny prawns for our lunch. I prepared this prawn hash quickly to serve along with a simple sambhar for our lunch, needless this delicious puttu tastes excellent with wonderful flavours and everyone at home simply loved it.Sending to Asiya Omar's Feast of Sacrifice. Cook the prawns with turmeric powder and water until they turns soft, smash the cooked prawn pieces. Add the pepper powder, cumin seed powder, fennel seed powder, salt to the cooked mashed prawn pieces. Heat enough oil and let splutters the mustard seeds and urad dal, add the chopped ginger,chopped green chillies and chopped garlic pieces to the seeds and fry until they turns slight brown. Add immediately the chopped shallots or onions and cook everything until they turns transculent. Now add the cooked and spiced prawns and toss everything gently, cook everything in simmer until they turns dry and get well fried.. Finally add the chopped coriander leaves and grated coconut to the puttu, cook for few minutes and put off the stove. Since i heard lot about the nutritious value of foxtail millet, i couldnt stop myself to get them from organic stores. I prepared recently this healthy,nutritious,super filling and satisfying upma with sweet corn kernels and foxtail millet. 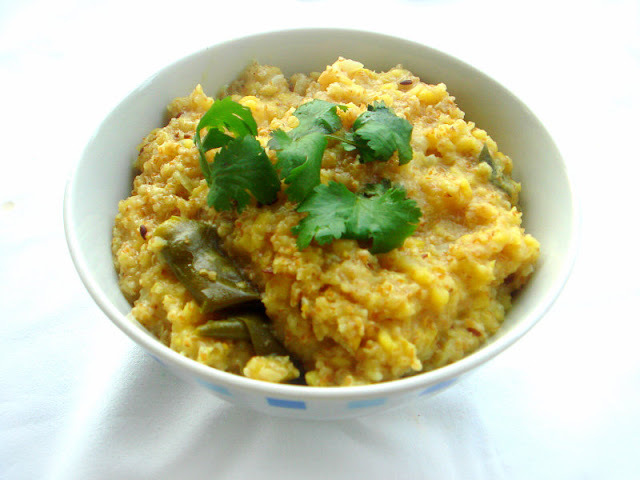 An excellent food to enjoy without any guilt which gets ready very quickly if you cook your foxtail millet through pressure cooker apart from it, this dish goes for usual spices. 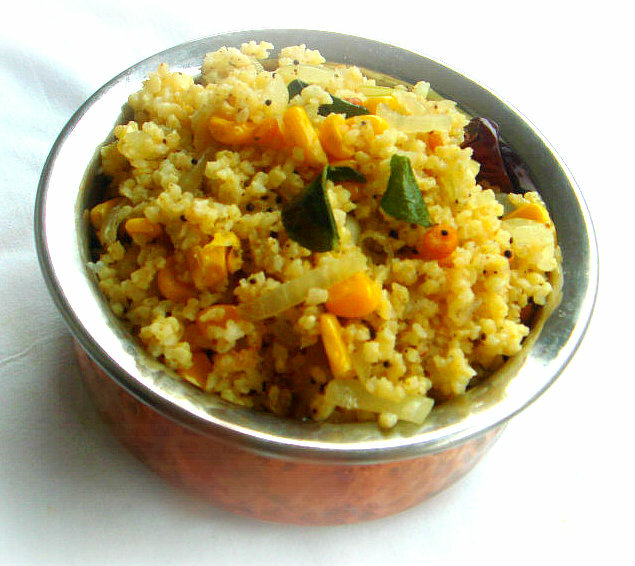 You can enjoy this healthy upma even without any side dish eventhough i loved it with Urad dal chutney. This foxtail millet and sweet corn upma is my third day post of blogging marathon under the theme 'Upmas' i choosed for this second week of blogging marathon,check out the other marathoners running this 21st edition of blogging marathon here. Wash the foxtail millet and pressure cook with 2cups of water upto 2hisses. Heat enough oil, let splutters the mustard seeds, urad dal,channadal,dry red chillies,fry until they turns brown. Add now the sliced onions,curry leaves and salt,saute until the onions turns transculent..
Add now the sweet corn kernels to the cooking onions, stir continously for few minutes, add immediately the cooked millet and pepper powder,cook for few more minutes,put off the stove. Rice flakes aka aval is a must in my pantry, i love to cook with this rice flakes. I have already posted many variety of foods with these rice flakes in my space. When i choosed Upma for this week's blogging marathon,i know that i'll be surely making my favourite aval upma but definitely not the usual one. I grabbed a packet of red rice flakes during my last visit to Indian grocery.I used those healthy red rice flakes for making this wonderful looking upma with some chopped button mushrooms. This upma turned out awesome and we simply enjoyed with some coconut chutney.A wonderful,filling upma to enjoy either for breakfast or for dinner,check out the other marathoners running this 21st edition here. Soak the red rice flakes in water for few seconds and drain the water completely,keep aside. Heat enough oil, let splutters mustard seeds, urad dal,channadal,dry red chillies,curry leaves, add immediately the chopped onions, chopped green chilies and cook until the onions turns transculent..
Now add the chopped mushroom, saute them for few seconds. Finally add the turmeric powder, salt and add the already washed red rice flakes. Cook everything in medium flame for few minutes and put off the stove..
For our dinner, if am serving dosas or idlis i have to prepare atleast two different chutneys else my H will definitely wont enjoy his dinner, so obviously if i get to know a new variety of chutney i wont even hesitate a second to try and serve it to him. For this month's blog hop wednesdays, Radhika paired me with a wonderful blogger Nalini of Nalini's Kitchen. I love Nalini's space and visit her space frequently, if i get a chance to cook from her space do i need to say am a happiest person in the world. Immediately i went through her space to choose a recipe,omg its quite a hard task for me to choose. 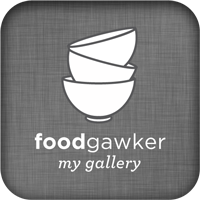 Seriously i want to try all her recipes, they were authentic,irresistible and delicious. With her beautiful clicks, she rocks and you will definitely love her space very much.For bloghop wednesdays, i choosed her Urad Dal Chutney one of her mom's recipe and prepared it two days back to serve along with soft idlies. 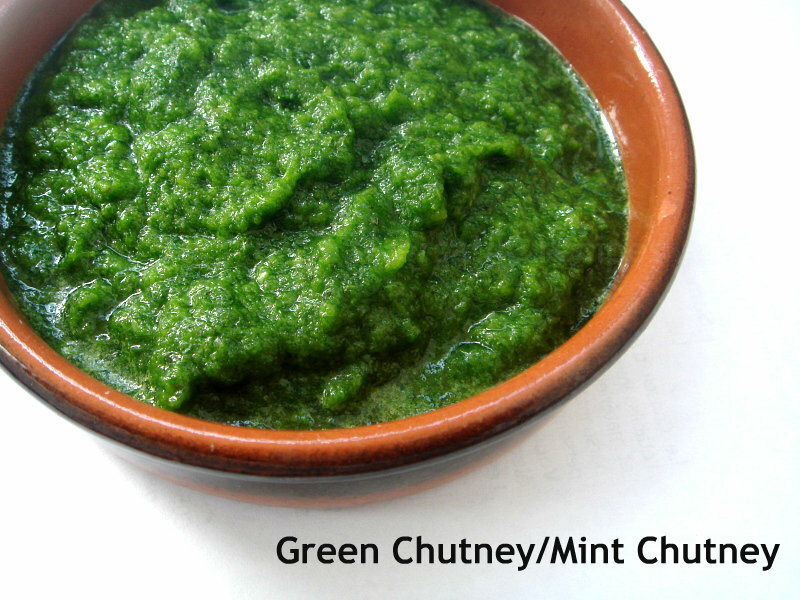 We just loved it,thanks Nalini for sharing this chutney its definitely a keeper and i'll make surely quite often this easy breezy chutney. Heat enough oil, fry the grated coconut,red chillies, tamarind together until a nice aroma comes from, remove it and keep aside. To the same pan, heat again a teaspoon of oil and fry the urad dal,asafoetida powder and curryleaves until the urad dal gets well roasted. Once everything gets well cooled, grind everything together with enough water and salt as bit coarse paste. Transfer it to a bowl and serve immediately. This chutney doesnt need tempering. We start again a week of blogging marathon, for this second week of blogging marathon i choosed upmas as theme, so for the next two days i'll be posting variety upmas. 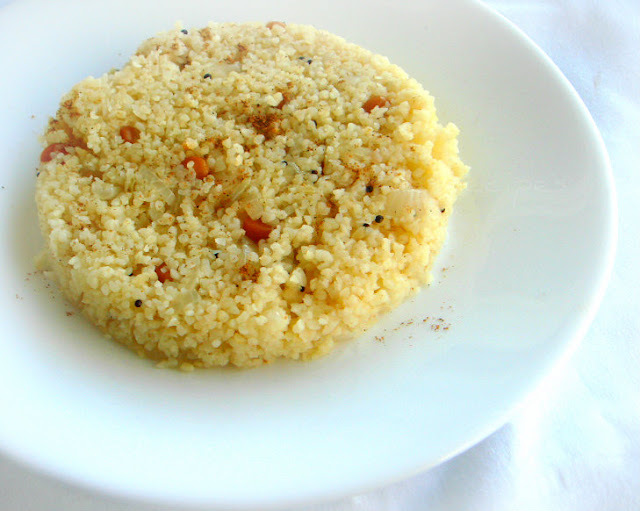 For the frist day of blogging marathon, am posting a quick,easy,healthy and super filling upma with couscous. 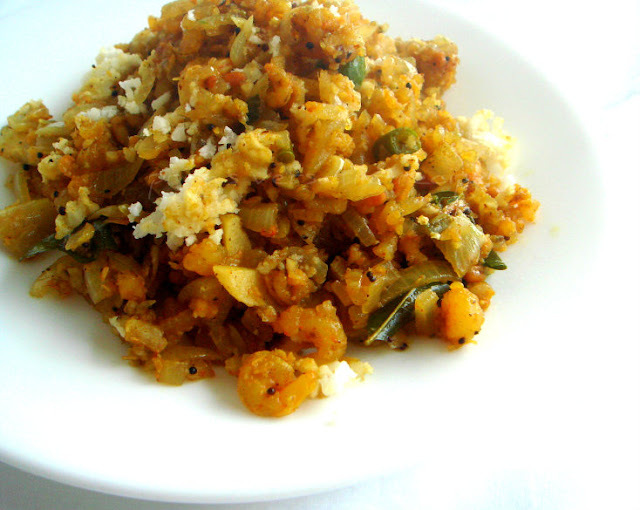 I simply used onions and usual spices to make this upma,you can very well go for mixed veggies while making this upma. Coming to this couscous upma, even a bachelor can make this quick upma very much easily and definitely everyone at home will enjoy thoroughly this upma, i served this upma with a dash of chaat masala and we just loved it.Check out the other marathoners running this 21st edition here. Soak couscous for half an hour in 4 cups of water,drain the excess of water and keep aside. Add now the sliced onions,grated ginger,curry leaves,salt and slit opened green chillies,saute until the onions turns transculent..
Add now the soaked couscous to the cooking veggies, stir continously until the couscous gets well cooked,put off the stove. 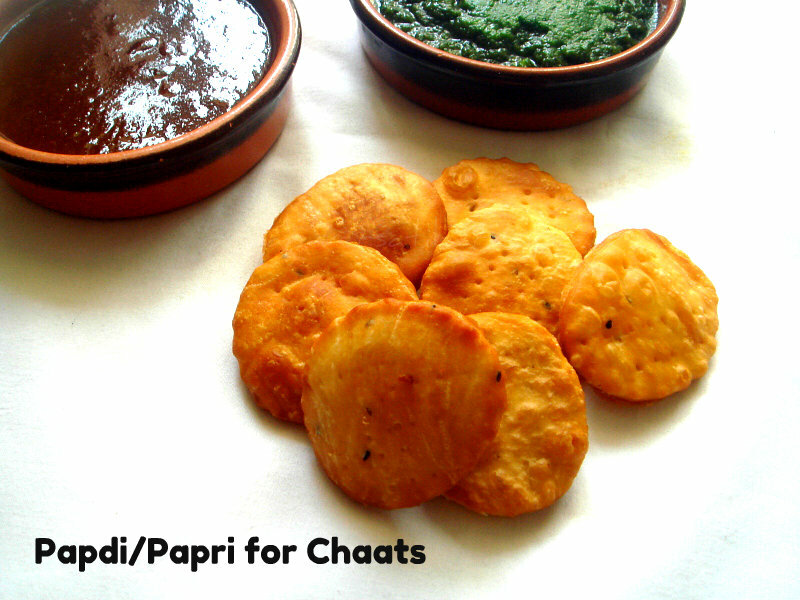 Serve topped with a dash of chaat masala and enjoy. Do check out my guest post Oats & Badam Halwa Poli at Siri's Food Flavours. 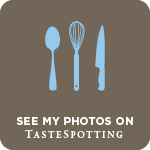 Doing guest post to a co-blogger is quite interesting, recently i got a message from Sangeetha of Recipe Excavator asking whether i can do a guest post for her. Who will say no to this great opportunity, immediately we chitchat through mail and she kindly asked me to make something baked for her with stepwise pictures. She was asking me from a long why am not posting stepwise pictures, as most of you know i have almost more than 2000posts in my space, coz of this space contraint i couldnt post stepwise pictures. I truly used this opportunity to make a stepwise pictures of my guest post for Sangeetha. 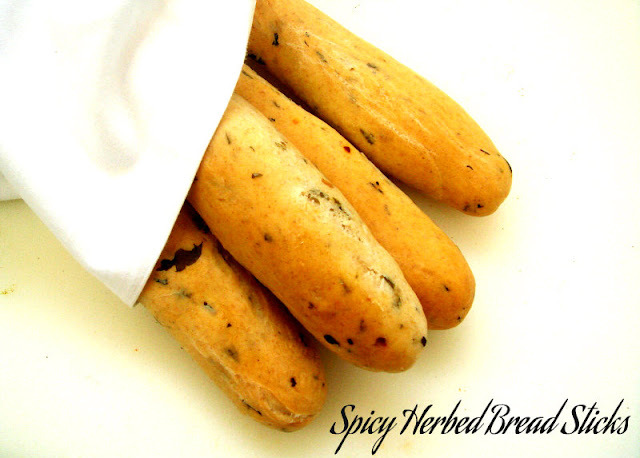 Initially i want to make some cake but finally i decided to make this excellent,super delicious spicy herbed breadsticks,they came out prefect. She was quite happy for getting her requested stepwise pictures from me and this breadsticks i prepared for specially for her. Add the yeast,sugar and salt to the luke warm water and keep aside until the yeast turns foamy. Take the flours in a bowl with chopped coriander leaves,red chilly flakes,dry oregano and dry thymn leaves,add gradually the foamy yeast,olive oil and water. Knead as a soft and smooth dough,cover the bowl and keep the dough in a warm place for two hours..
Once they doubled their size,punch down the dough,dust the dough with flour and roll them as a medium size long rope like strips. Arrange the rolled breadsticks over a baking sheet lined over the baking tray. Arrange the baking pan in middle rack of the oven and bake for 25-30minutes until the crust of the bread stick turns golden brown. Brush immediately the bread sticks with the butter. Serve warm with a bowl of soup. Being a South Indian, i would love to cook and eat North Indian foods, just i love their foods. Every month, if you get a chance to cook from this part of India, who will say no, definitely not me. When Divya of You Too Can Cook announced a monthly challenge between Southern and Northern part of India, i want to be a part of this group, immediately i joined this group.For this month's first challenge, Shruti of Shruti Rasoi challenged Bhelpuri chaat, a popular street food chaat from Mumbai to us (for the Southern group) while Divya of Divya's Culinary Journey challenged Mysore pak to the Northern group.As am a part of Southern group, i have to prepare bhelpuri chaat for this month's challenge. 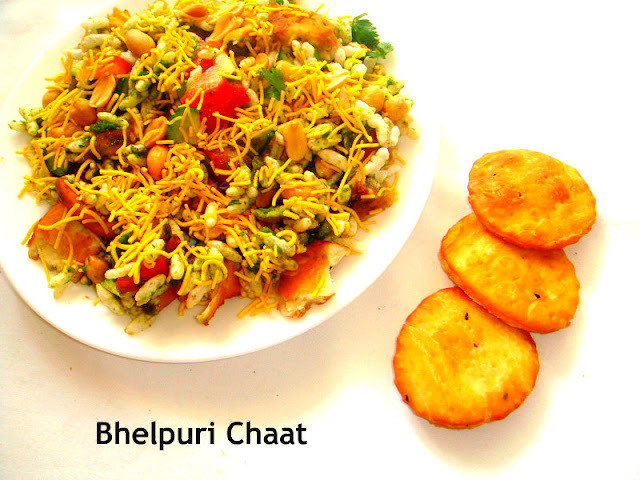 Finally here is my bhelpuri chaat i prepared yesterday and enjoyed thoroughly. Thanks to Shruti for this incredible challenge, loved it. Take a large bowl, crush the fried papdis and take them in a bowl, add now the puffed rice,sev, cubed potatoes, chopped onions,chopped cucumber,chopped tomatoes,grated raw mango, lemon juice,salt and give a stir. Add immediately the green chutney and sweet tamarinf chutney and toss gently until everything gets well mixed. 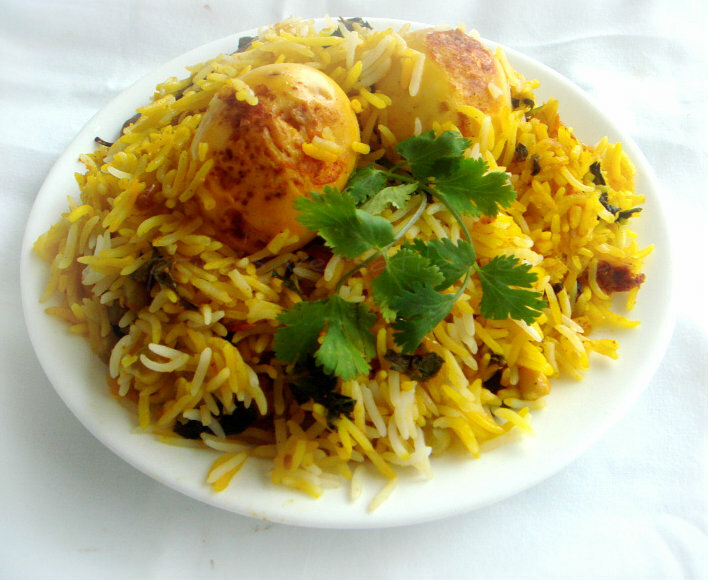 Serve immediately wiith chopped coriander leaves and sev. Our week menu will definitely have fingerlicking tangy gravies atleast once a week. I used to prepare this tangy gravies either with veggies or either with beans. 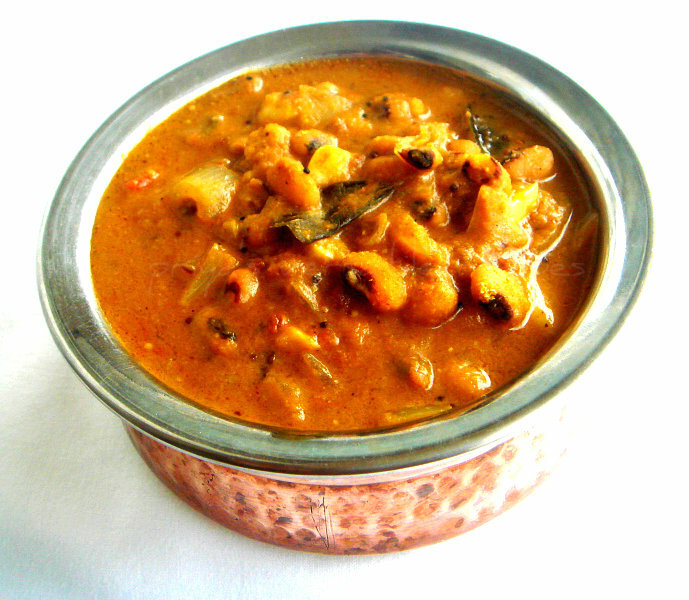 For this week menu, i made this droolworthy,delicious gravy with cooked black-eyed peas and fenugreek seeds with coconut paste and a spice powder prepared with just coriander and fenugreek seeds. This gravy tastes super delicious when served simply with a bowl of hot steaming rice and fried papads. They tastes even more delicious after a day and stay prefect for a week if they are conserved in fridge in an air-tightened box.Usually i dont add coconut paste in my gravies, but this time i prepared this gravy with coconut paste as our this month's Magic Mingle challenge's magic ingredients goes for fenugreek seeds and coconut. This gravy will satisfy your tastebuds and definitely one of the best way to sneak this bitter fenugreek seeds. 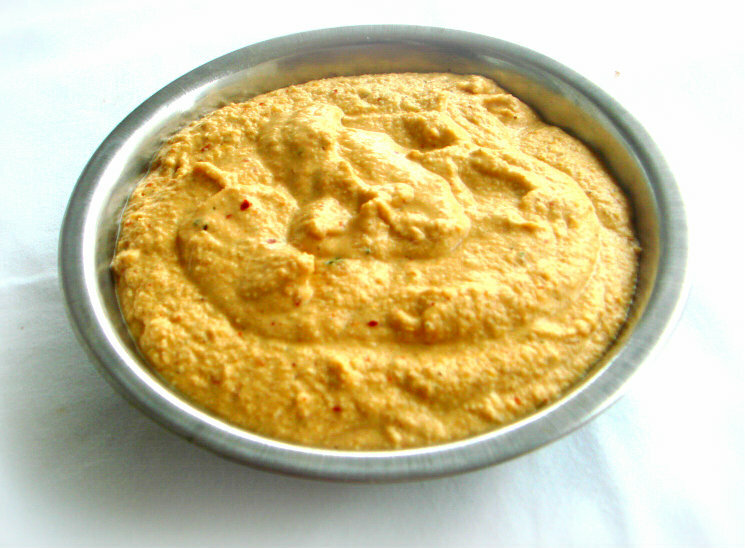 Grind the coconut and fennel seeds together as fine paste and keep aside. Meanwhile dry roast the coriander seeds and fenugreek seeds together and grind as fine powder,keep aside. Heat the gingelly oil, let splutters the mustard seeds, fenugreek seeds,curry leaves and cumin seeds, add immediately the cubed onions, crushed garlic cloves,curry leaves and chopped tomatoes,saute everything until the onions turns transculent. Add the cooked beans to the veggies, cook for few minutes, now add the tamarind extract, red chilly powder along with salt and cook for few minutes with lid closed. Finally add the coconut paste,grounded coriander-fenugreek powder and cook until the oil gets separates and put off the stove.. Serve along with rice and papads. 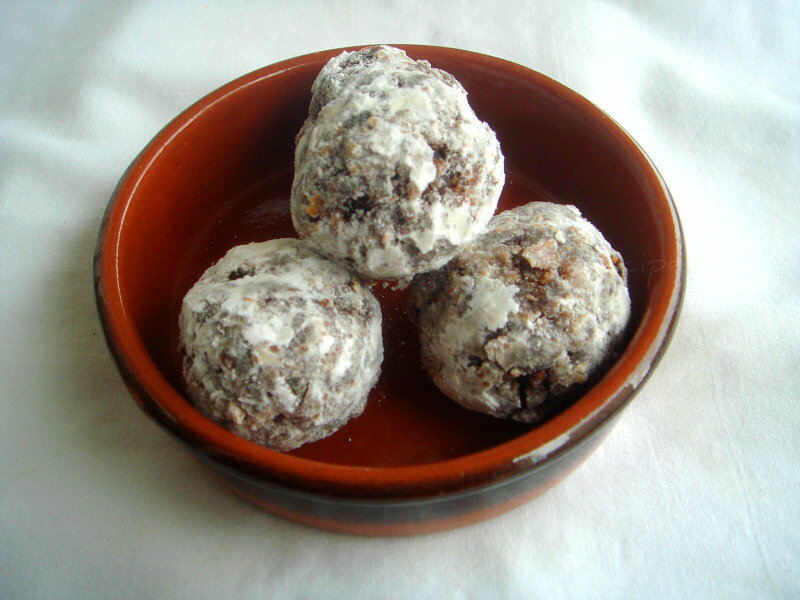 If you want to make some attractive kid's friendly cereal balls, give a try to this super quick,easy breezy and attractive balls with chocolate and cornflakes.Actually i want to finish some leftover cornflakes sitting since a long in my pantry, finally i finished them as these quick and addictive balls for our yesterday snacks. My kids couldnt stop themselves having this healthy delicious balls. I used confectioner's sugar for coating so that these balls looked exactly like snow balls. Today is our last day of blogging marathon, as i choosed Kid's delight as theme, these cute balls suits prefectly and am sending them to Srivalli's Kid's Delight-Anniversary Potluck Party.. Check out the other bloggers running this 21st edition here. Take the grounded cornflakes,powdered sugar and unsweetened cocoa powder in a mixing bowl. Now add the melted butter and mix everything well. Sprinkle enough milk and turn everything as a thick mixture. Take enough mixture and roll it as medium sized balls, roll this balls in confectioner's sugar and conserve them in an air tightened box. Enjoy anytime of the day. I have seen rarely kids saying 'no' to fudges, my space have varieties of fudges eventhough somehow i want to make some with my favourite peanut butter spread. 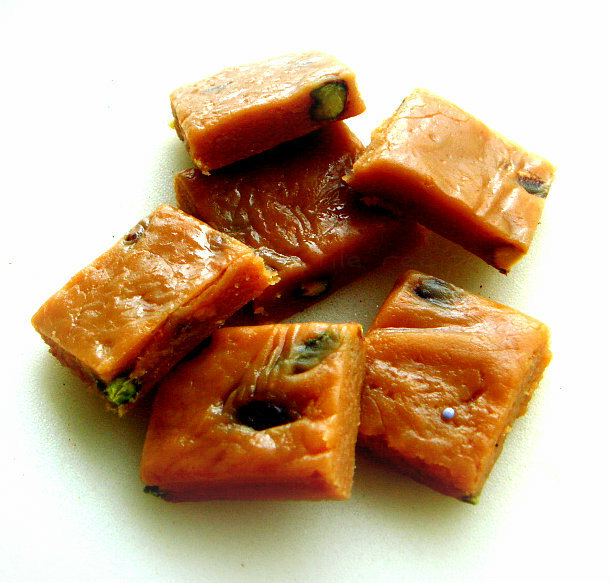 Fudge is one of the mouthwatering confections between candy and cookies. You may think that its too difficult to make fudges, but it really easier and quicker than you think. To make your own fudge at home,you just need simple ingredients available in your pantry. Am starting this month's blogging marathon first week with Kid's Delight-Anniversary special as theme, obviously this week is going to be kid's favourite foods. 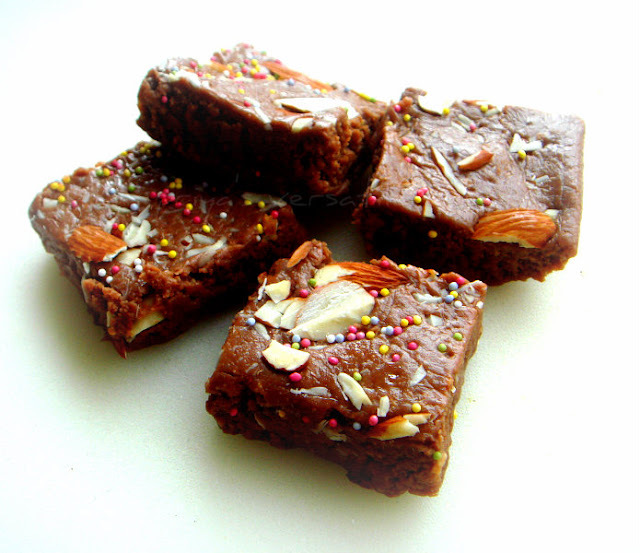 Homemade fudges can be served very well as dessert and can also served on many different occasions. Peaut butter fudge with pistachios are really very easy to prepare and they gets ready very quickly, our recent favourite and we couldnt stop having them.Check out the other marathoners running this 21th edition here.Sending this fudges to Srivalli's Kid's Delight-Anniversary Potluck Party. In a heavy sauce pan, melt the white chocolate chips,butter,condensed milk,peanut butter and stir continously. Remove the pan and add the pistachios nuts and spread the mixture over a baking sheet lined over a rectangular pan and keep aside until the mixture get cooled. Arrange them in fridge for atleast 2 hours or until firm. Cut into squares and enjoy it.. I was planning to make a flavourful dal based curry called sambhar with lotus root, obviously i went to chinese store and picked them from frozen section. 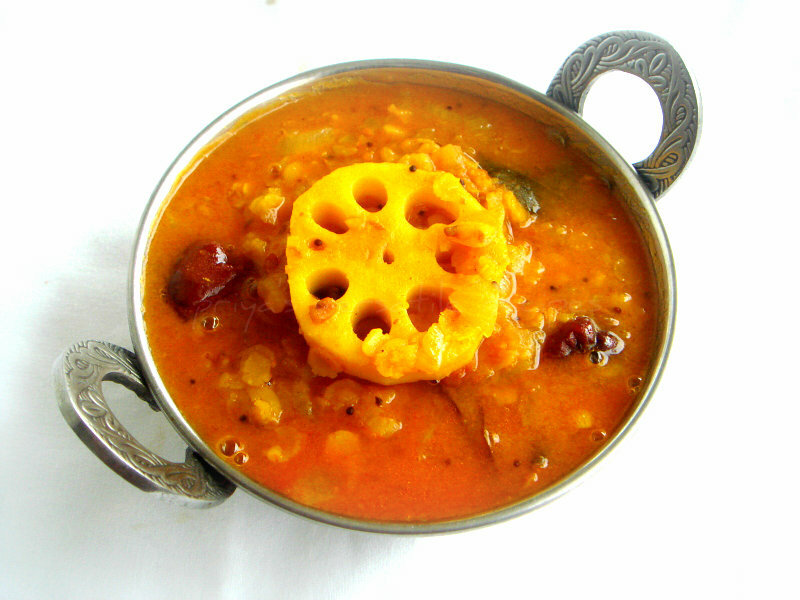 Yesterday we got a mail from Vaishali about our this month's Magi Mingle challenge with fenugreek and coconut as magic ingredients, first thing came to my mind is to make some sambhar with lotus root and fenugreek. I love fenugreek in sambhar and i do add everytime while making the tempering for sambhar, this time i used fenugreek seeds in both my tempering and in my spice powder i prepared specially for this sambhar. Yep instead of using sambhar powder, i prepared a spice powder with coriander seeds, fenugreek seeds, dessicated coconut,dry red chillies along with asafoetida powder. This sambhar tastes simply awesome when served along with hot steaming rice topped with ghee and fried papads. We had a fabulous and slightly bitter lunch yesterday, since bitter is better to health its really wonderful to have this kind of dishes once in a while in your diet. Dry roast the ingredients given in the list 'Roast & grind' one by one and grind as fine powder, keep aside. Heat enough oil in a pressure cooker, let splutters the mustard seeds, urad dal, fry the fenugreek seeds,cumin seeds and dry red chillies,add now the chopped onions,chopped tomatoes,curry leaves,cook for few minutes until the veggies get cooked. Now add the lotus roots cook for few minutes, add enough grounded spice powder,turmeric powder along with salt,cook everything in simmer for few minutes.. Finally add the cooked dal and enough water to the veggies, cook everything in medium flame with lid closed until the gravy gets thickens. Add the lemon juice and put off the stove. Serve hot with rice and papads.